BIG SALE!! QUARTZ RUTILATED BALLS SPECIALS BIG SALE!! 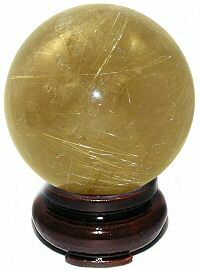 This AA "Gold" Rutilated Quartz sphere from Brazil has excellent clarity with beautiful rainbows and gold rutile crystals or threads. It has excellent polish with some minor natural cracks in the finish due to the nature of the stone. Rutile magnifies the healing and spiritual properties of Quartz Crystal as well as being a rare and costly specimen. Quartz magnifies the Chi life force, the spiritual core of being and enhances its flow, nourishing the mind, emotions, and physical body. The Oriental Rosewood Stand is sold separately. This Rutilated Clear Quartz sphere from Brazil has a mixed clear and milky quartz matrix with some good clarity and some milky veils and inclusions. It is loaded with highly reflective medium thick gold rutilated crystals or threads on all sides. It has excellent polish and finish with only minor cracks due to the nature of the stone. The Oriental Rosewood Stand is sold separately. 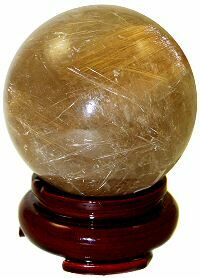 This rare Gold Rutilated Smoky Quartz sphere from Brazil has a medium smoky quartz matrix with good clarity and rainbows and is loaded with hundreds of highly reflective thick gold rutilated crystals or threads on all sides. It has excellent polish with a couple of very minor natural cracks in the finish due to the nature of the stone. Rutile magnifies the healing and spiritual properties of Smoky Quartz. Smoky Quartz has a gentle yet intense clearing quality that dissolves habitual negative thoughts and feelings that can poison daily life. The Oriental Rosewood Stand is sold separately. 64mm or 2 5/8" Sphere - 13ozs. 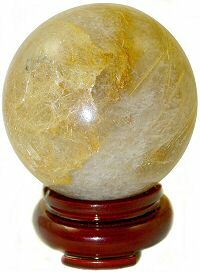 This rare Gold Rutilated Citrine/Smoky Quartz sphere from Brazil has a light citrine/smoky quartz matrix with some good clarity and rainbows and is loaded with highly reflective thick gold rutilated threads on all sides. It has excellent polish and finish with no cracks. Rutile magnifies the healing and spiritual properties of Smoky Quartz. Smoky Quartz has a gentle yet intense clearing quality that dissolves habitual negative thoughts and feelings that can poison daily life. The Oriental Rosewood Stand is sold separately. 66mm or 2 3/4" Sphere - 15ozs. This exquisite finely Rutilated A Clear Quartz sphere from Brazil has great clarity with a multitude of rainbows from all sides. 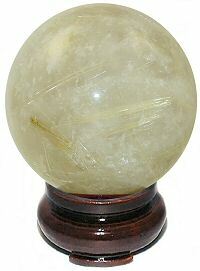 It has fine gold and black rutile crystals or threads on the top half of the sphere. It has excellent polish and finish with only very minor natural cracks in the finish due to the nature of the stone. Quartz magnifies the Chi life force, the spiritual core of being and enhances its flow, nourishing the mind, emotions, and physical body. The Oriental Rosewood Stand is sold separately. 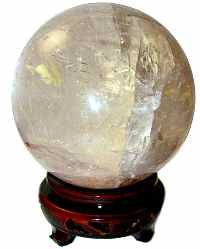 A superb 100mm Rutilated A Quartz sphere from Brazil has good to excellent clarity and is loaded with beautiful rainbow inclusions giving this sphere wonderful views from all sides. This unusual sphere also has deep gold hematoid deposits (also known as Fire Quartz) which indicate the presence of Hematite (Iron). The fine gold rutilated threads are concentrated on one half of the sphere. It has excellent polish with a couple of very minor natural cracks in the finish due to the nature of the stone. 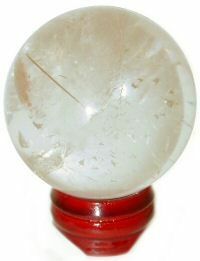 Rutile magnifies the healing and spiritual properties of Quartz Crystal. Quartz magnifies the Chi life force, the spiritual core of being and enhances its flow, nourishing the mind, emotions, and physical body. The Oriental Rosewood Stand is sold separately. This rare Gold Rutilated Quartz sphere from Brazil has a milky quartz matrix and is loaded with hundreds of highly reflective thick gold rutilated threads on all sides. It has excellent polish and finish with no cracks. 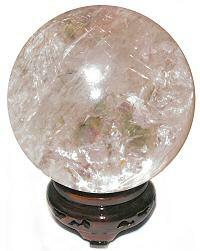 Rutile magnifies the healing and spiritual properties of Quartz Crystal as well as being a rare and costly specimen. Quartz magnifies the Chi life force, the spiritual core of being and enhances its flow, nourishing the mind, emotions, and physical body. The Oriental Rosewood Stand is sold separately.